Top producing computer based on recent average credit! Your production numbers have gone up some also... I was wondering if you were trying to pass me up again. You know all my PrimeGrid setup secrets, so you should be able to pass me with all your GPUs. If I reduced my CPU tasks from 6 cpus down to 4 I could probably do even better points wise, but I want all silver badges in the CPU projects. I still don’t really like those math stuff ... I keep some mix with my beloved proteins to some degree. Whatever the scheduler right now assign. New silver on Cullen LLR and moved up two badges on PPS (Sieve) to Emerald. 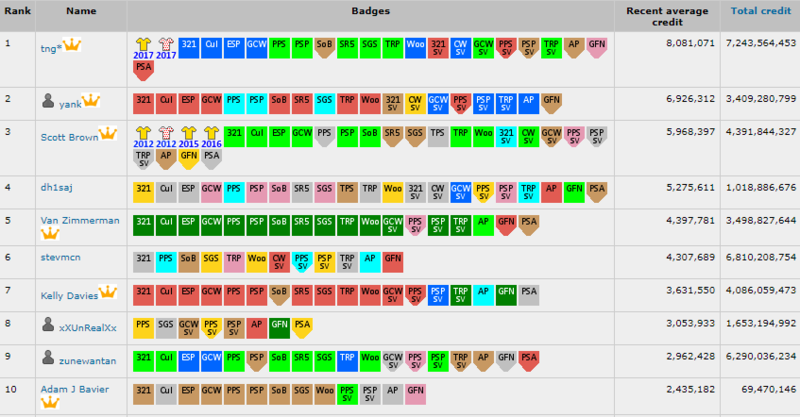 Emerald is the highest square badge, then I move to a shield looking badge called double bronze for 100 million points. Should have a silver coming in for "Woo" aka Woodall LLR once my wingman finishes their crunching. I likely won't be able to move up a spot, since keeping an average of 3 million is unlikely unless I don't use my computer for an extended time period. atp1916, ChristianVirtual and pututu like this. Congratulations! Our records indicate that a computer registered by you has found a unique Arithmetic Progression of primes of length 24. This computer is assigned to the AP27 project. Since primes found in this subproject are not large enough to report to the Top 5000 Primes List, your AP24 sequence is visible immediately. You can select the minimum length of AP for which to receive these notifications in your PrimeGrid preferences. MN Scout, pututu and ChristianVirtual like this. phoenicis I see you flying up from behind me! Oh wow. I'll be choking on dust in a mere days. Just earned the PSA badge for my manual sieving efforts. Proud of this one, since it requires running a program via command line, and reserving ranges on their site. Also added the silver 321 badge, and the Amethyst GFN badge for crossing over the million point threshold. since it requires running a program via command line, and reserving ranges on their site. Got my first shield badge! 100 million points in PPS-sieve. Also skipped over a bunch of badges for PSA manual sieving and I'm now sitting at Ruby for 2 million points. Going to get PPS-Sieve to a silver shield then start crunching on GFN again. Now onto The Riesel Problem which I don't even have a bronze badge for. 10 days estimated till silver. Gilthanis and ChristianVirtual like this. MN Scout and phoenicis like this. New SR5, GCW-SV and TRP badges. Working on moving SR5 to silver. 20 days away from flipping the PPS-SV shield to silver. Congratulations! Our records indicate that a computer registered by you has found a unique Arithmetic Progression of primes of length 20. This computer is assigned to the AP27 project. Since primes found in this subproject are not large enough to report to the Top 5000 Primes List, your AP20 sequence is visible immediately. GCW and PPS silvers. Emerald on PSA for running the GFN sieving units. I'm going to run GFN15 tasks during the Pierre de Fermat's Birthday Challenge on my GPUs this coming Friday. I think I'll get through 12,000 tasks in the 3 days. Maybe one will be a prime? Also bested my previous highest World position that I set in 2009.
motqalden, ChristianVirtual, Gilthanis and 1 other person like this. motqalden, MN Scout and ChristianVirtual like this. motqalden and tayunz like this. Congratulations! Our records indicate that a computer registered by you has found a unique Arithmetic Progression of primes of length 21. This computer is assigned to the AP27 project. Since primes found in this subproject are not large enough to report to the Top 5000 Primes List, your AP21 sequence is visible immediately. tayunz and Gilthanis like this. RFGuy_KCCO and motqalden like this. Congratulations! Our records indicate that a computer registered by you has found a unique Arithmetic Progression of primes of length 22. This computer is assigned to the AP27 project. Since primes found in this subproject are not large enough to report to the Top 5000 Primes List, your AP22 sequence is visible immediately. RFGuy_KCCO, motqalden and Gilthanis like this. 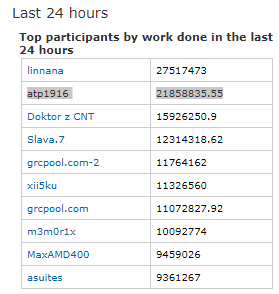 Congrats atp1916 for being the 2nd highest producer in the last 24 hrs. RFGuy_KCCO and tayunz like this. lol, yeah these AP26/27 WU find "Arithmetic Progression of primes" a little too fast. I found 15 already and I just started.